A weekend of a lifetime right on your doorstep. With the weather getting better and signs, dare we say it, of a ‘grand stretch in the evenings’, thoughts are beginning to turn towards holidays. Increasingly, holidaymakers are realising that they don’t have to step on a plane to make the most of a well-earned break and why would you when there’s so much to see and do right on your doorstep. Northern Ireland is only just a bit up the road, but it's packed full of incredibly fun things to do. With that in mind, if activity is what you’re after, the folks at Discover Northern Ireland are offering the chance for four people to experience a weekend full of adventure in Derry and Belfast, a prize worth €1,000 in total. 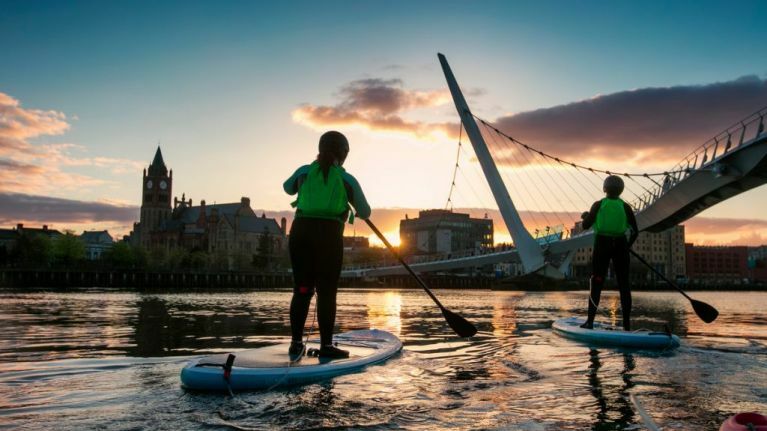 And if that’s just a little too exciting, then the travelling party can wind down with some Stand Up Paddle Board Yoga (SUP Yoga) on the River Foyle in Derry, where you can take in all the sights of the city in the background. As well as that, the prize also includes a meal at Brickwork restaurant and an overnight stay in the Maldron Hotel in the heart of Derry city to really round off the weekend. Discover Northern Ireland is the official tourism body for Northern Ireland. Discover inspiring things to do, places to stay, world class events, and the best places to eat and drink to make the most of your short break.